When I go looking for a new game, I am often on the lookout for new and novel ideas. Perhaps a rarely- or never-seen-before mechanic; or how about something which captivates on an already engaging mechanic and makes it truly spectacular? That’s my usual tastes, so it was my surprise when I found my thumb itching to press the “Download” button for Looney Tunes World of Mayhem, of which there is very little of new, or never seen before, or even improvement on mechanics. However, if there’s one thing that definitely made me click onto it, it was the Looney Tunes brand itself. Sometimes, brand awareness really is best – And here is what I think about World of Mayhem. Now I know I’m late to the party, as it’s been about a year or so now since this leviathan board game entered circulation, but as I do not own a copy, and it has taken us a while to get a few games in with the copy in my gaming circles, only now do I think I’ve played enough to offer an opinion. Northgard, developed by Shiro Games, is a strategy game built on Norse mythology. Of course, said mythology is oft-filled with inaccuracies, due to how much of it has been pieced together through texts, before being adapted to various modern video game and film ventures. Northgard now brings the Vikings to a finely tuned strategy game, but will you fight or fall to the harshness of the land, or will the cold of the winter be your undoing? Two brothers are farming, trying to get the perfect conditions for their creatures to breed and provide produce. One brother is farming Wabbits, whilst the other is farming Gobbles. One brother believes in farming in an L shape, the other believes in farming in a straight line. Only one brother can claim enough of the land over the other in this game of 2 or 4 players – Read on to find out more about the latest game by Ankama Boardgames, Brothers! The more I play and study games, design, and ludology, the more I notice the little things and enjoy going overly in-depth on little details like ambient audio, set-dressing, and camera positioning. Your choice of camera style changes the nature of play rather radically alters how you play, your involvement and your experience of the game. Can you imagine playing Mario from first person? Or Halo as an Isometric hack and slash? Available for Linux, OSX and Windows via Humble Bundle and Steam for £14.99, there is also a free PC demo available. A long time ago in a galaxy not so far away there was a team of developers who went by the name of Psygnosis. Psygnosis were well known for producing very beautiful and excellent games like the classic Barbarian (1987) and Shadow Of The Beast (1989). Sometime in 1993 Psygnosis were consumed acquired by the mighty Sony and continued to produce quality products like the fantastic futuristic racing game Wipeout. But let’s not forget one of their biggest games, selling in the region of 15 million copies over multiple platforms and that was called Lemmings. Now, like Timlah I too am a big fan of most of the work that Team 17 put out. It takes a very brave bunch of developers to take on a product that has already sold 15 million copies and especially in today’s market where the focus is leaning towards high impact graphics and open worlds, is there room for a classicly animated A to B puzzle game? Flockers was originally released in 2014 and on first glance there really is not denying the similarity between it and Lemmings. You are put in control of a flock of fluffy sheep that are escaping their diabolical masters (the Worms). The sheep aimless walk from left to right only changing direction when the hit something they cannot overcome. You guide them to safety aiming for the exit along the way solving the various puzzles to get over/around obstacles. Points are awarded for every sheep saved, and by using less of the tools that you acquire, finally awarding you up to a total of total three stars. However very unlike Lemmings you pick up tools along the way rather than be given a set number at the start. Sheep can die in a number of ways, first and foremost is the environment which is littered with nefarious contraptions that are set to squish, impale or slice up your sheep. Another way to reduce the numbers is to let your sheep fall too far, this can be counteracted by giving the sheep a soft landing (another sheep). Of course, you can also loose sheep by destroying them yourself; yes, every now and then you will have to sacrifice the life of one of your fluffy little friends for the good of the flock. The main method of control is the mouse, simply select the tool you want from the bar at the bottom of the screen and then click a sheep to activate that tool for that sheep. Pressing the right mouse button gives you a much wider cursor which is great when you want to make a lot of sheep do the same thing and not have to click 50 times. You also have the ability to zoom in and out of the scenes so that you can see what is up ahead and try to predict what is going to happen. Team17 have also integrated the keyboard a bit to try and help you quickly switch between one tool and another. Numbers 1-0 will select the tool sitting in that slot, letters Q and E will shift the tool that you are on left or right one. You can speed up the movement of the little sheep by pressing the left shift key which is useful for the impatient. Team 17 have a huge pedigree for having a great art style to their games and Flockers is no exception to this. The backgrounds are detailed and moody with great use of lighting, spikes implements are suitably covered in blood and make a quite fun squidgy noise when your innocent little sheep happen to wander onto them. Switches make a satisfying click when activated, it’s the kind of quality that you would expect from a seasoned house such as Team 17. Your little sheep are animated well, and lovable but equally fun to see them burst into streams of blood. Well, I would like to say that I had no issue with Flockers at all but that is just not the case. There is a bug (at least on the OSX version) that crashes the game as soon as it tries to load the main menu. It turns out that it’s related to the online link and if you turn off your network so that the game cannot connect to the internet then it’s fine. This small bug nearly ruined the game entirely for me, I hate it when I try to load any game and it just crashes. I would expect it on a game that is older perhaps but not 2014. This then also means that I cannot take advantage of user generated levels because as soon as I switch on the internet it crashes. Another annoyance is the fact that the level editor is only available for Windows. Yeah, I get it I own a Mac I am not allowed to have nice things. If you put those things aside then you have a perfectly good game. Is it just Lemmings? Well yes and no, there is certainly enough in Flockers for them to of made it their own. It looks, sounds and feels professional which is something you would expect from Team 17 and definitely worth investing in; £14.99 for it feels a bit cheeky though. I picked it up in a recent sale for £1.49 but probably would pay up to £10 for it. It has enough puzzle pieces there to keep you occupied for a few hours the difficulty curve is well balanced. Like any game of this type, there is a degree of frustration but that is half the reason to play; if only to yell at the screen when you complete a level a true sign of enjoyment. Co-operative to a point, Welcome to the Dungeon is a game about deceit and peril for one unlucky adventurer. But everyone who plays this game is the same hero, as you all vie to psyche one another out and enter the Dungeon. Timlah investigates one of the most recent additions to our collection of games. Flying a spaceship, fleeing from the rebel fleet, warning the Federation then defeating the rebels. Does this game sound good to you? Read on, my friends. I appear to be spacing out. 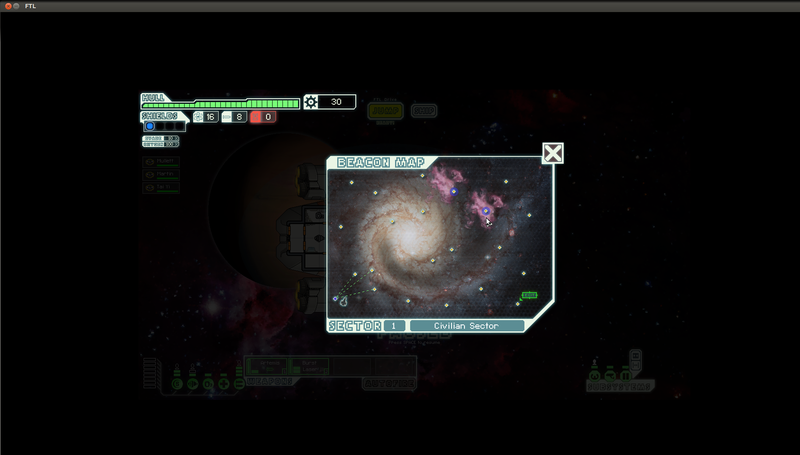 FTL: Faster Than Light is a very simple game by nature. Every time you fly to another beacon on a sector, you use up 1 fuel. Each time you use an attack, it might require a missile, or perhaps a drone piece (Depending on what kind of ship you’re running and the equipment you use). As such, you can’t run around going to every single square as a “Just because I want to”. This game actively looks to push you through to the last level – or to die trying. Every time you make a “Jump” (To go from one beacon to the next), the rebels get one step closer to you. Your goal is to get to the last sector and beat the Rebel Flagship – That’s about it. So in as far as story goes, there’s not much. To me, this benefits the game greatly, as the gameplay is superb. 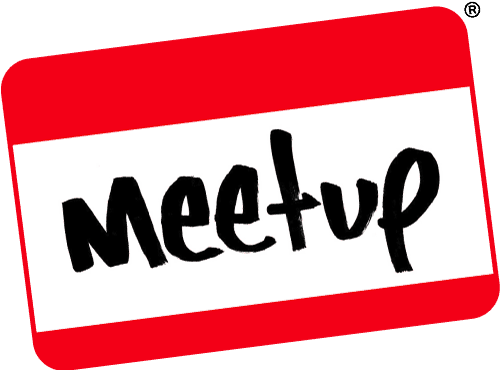 Simple, easy to follow and all in all fun. This is a true indie strategy game. Note, when I say it’s a true strategy game, this is a grid based game but the fight sequences are as much about timing as it is about pressing the right buttons for attack. So where’s the strategy element bar it being grid based? Due to it being grid based, going into different sectors and going into different parts of a sector can trigger different events, such as shops, quests, fights and answering distress beacons. 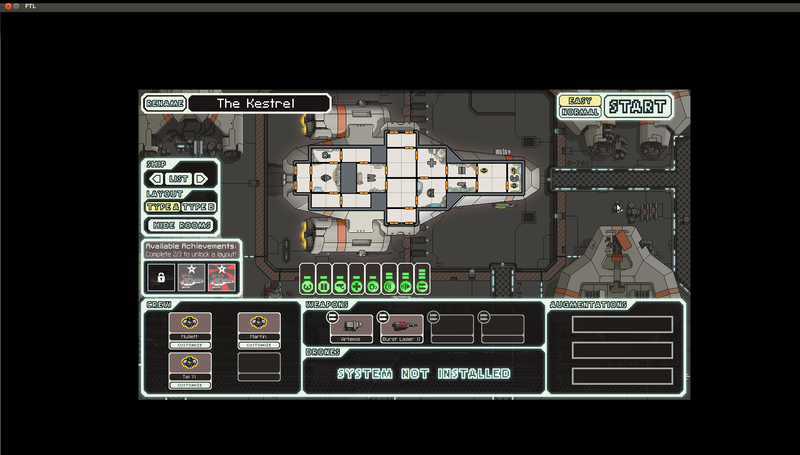 FTL is simple to play, but when I say hard to master, I’m not exaggerating. So, as I mentioned at the beginning of this post, FTL is a game where you are playing as a spaceship (When you first play, you can only play as the Kestrel, a decommissioned Federation Cruiser). Once you’ve chosen which ship you’ll be using (All of which have different “rooms” available, along with different crew members, different amounts of power and the likes) you’re greeted with the first sectors grid. 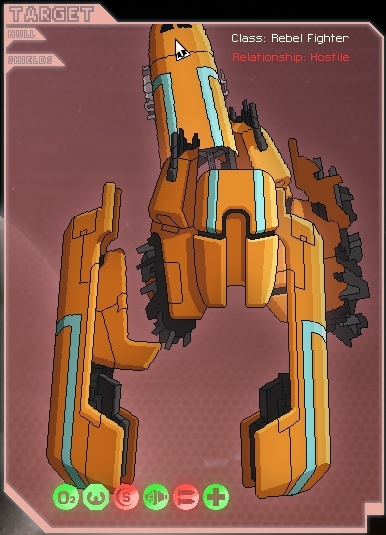 The Kestrel… To be fair is a great ship regardless, so you start with a useful ship! Once you’re ready to get going, you click the Jump button and you get ready to jump around space, going from beacon to beacon in hopes of getting enough scrap, better weapons, better shields and better crew. Your crew can level up in skills, such as weapons, shields, engines and piloting. This gives bonuses, such as faster shield regeneration, better weapon speeds and evasion. Your crew are of multiple races and as you go through the game, you can unlock the various other races ships. The different races have different bonuses to what they can do, too. For example, the energy people, the Zoltan, adds 1 power to a room whenever they’re in one. Nice! Jumping across beacons can lead to different events! Click a beacon and you’re off! So, you’ve now seen how it looks and how to move about, how about we have some combat? Well, as you enter combat, you’ll notice depending on what kind of beacon you jumped to, you might have bad effects due to the surroundings such as being too close to a star (Watch out for solar flares) or being in the middle of an asteroid field (Watch out for asteroids)! Once you’ve beaten the enemy by either destroying the hull (Get past the shields, then deal damage directly to rooms on the enemy ship) or by killing the enemy crew (Fire on the enemy ship, remove all oxygen, can’t work on an auto-ship, though!) you get presented with a reward of various degrees. The rewards vary, depending on what you do to defeat your enemy. By destroying the hull, you get a smaller reward than by keeping the ship alive. Sometimes, you trigger extra events by killing enemies in such different ways. I personally like to have the oxygen cut off as well as damaging their doors, but sometimes, you just have to straight up destroy a ship. And boy is it satisfying!? Yeah! Take that, you darn rebel! Now, I like to do a small part on music in nearly all of these games I play. 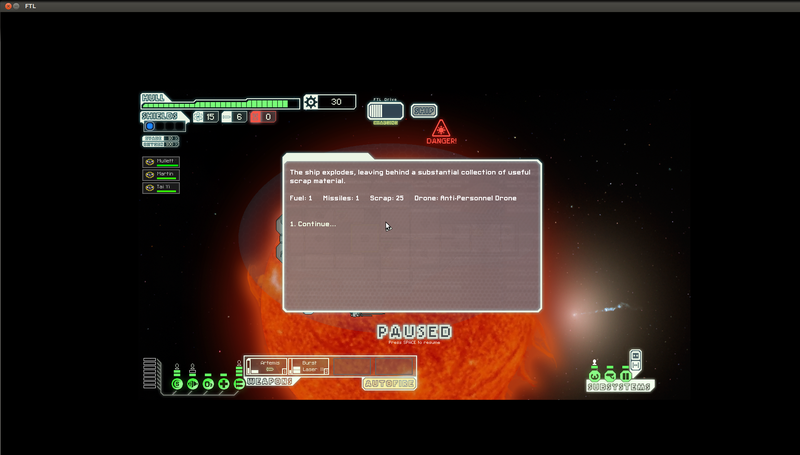 As such, how does music stand up in FTL: Faster Than Light? In writing this, I didn’t realise I was still listening to the soundtrack – the above link is a full playlist of music from the game, so please: Enjoy! 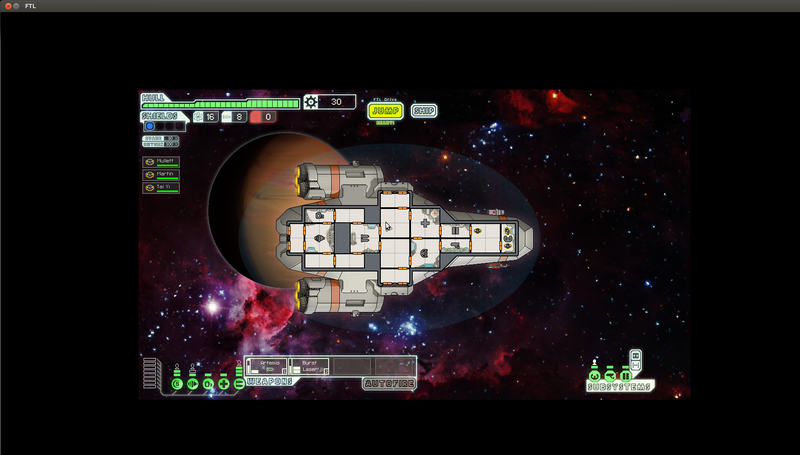 FTL: Faster Than Light is a game worth playing. For the casual gamer, this is a game you don’t need to invest all day and all night into, but for the serious gamers, unlocking everything is ridiculously hard. Some of the requirements for unlocking ships are practically down to pure luck, however. That is the only reason this game doesn’t quite get full marks. But this game is certainly worth playing never-the-less. 4.5/5 for this game from me.